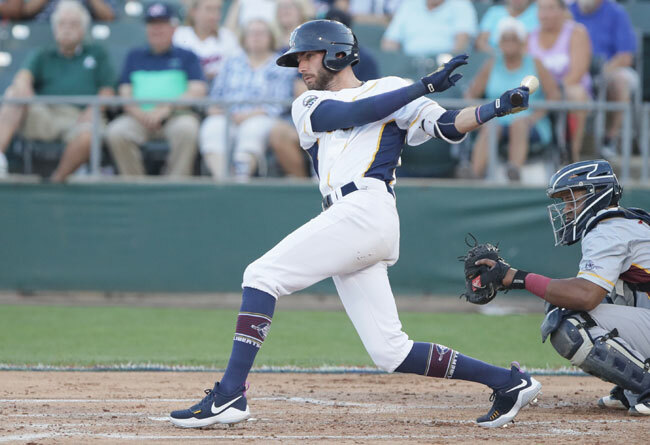 (Bridgewater, N.J., March 14, 2018) - The Somerset Patriots have re-signed 2017 Atlantic League All-Star outfielder Justin Pacchioli for the 2018 season. Pacchioli enters his second season with the Somerset Patriots and second in the Atlantic League. The speedy outfielder hit .281 with 30 RBI, 61 runs and 35 stolen bases (fourth in the league) over 97 games before he finished the season in the Boston Red Sox organization with High-A Salem. He earned an All-Star Game selection by hitting .345 in the first half of the season with a .453 on-base percentage. At the time, he was eight plate appearances shy of qualifying for league leaders, but both stats would have led the league. The Easton, Pennsylvania native carried three different 10-plus game on-base streaks throughout the season. That includes a nine-game hit streak from May 7 to May 17 over which he went 13-for-25 (.520) from the plate and a 14-game on-base streak from June 14 to July 4 over which he was 16-for-47 (.340) with 13 runs and 12 walks. Despite only playing in 97 games, Pacchioli led the team in stolen bases (35) and tied for the team lead in runs (61) and triples (4). He also committed just one error over 202 chances in the outfield, good for a .995 fielding percentage. The 25 year-old took off the 2016 season prior to joining Somerset for personal reasons after he spent his first season in professional baseball in the San Diego Padres organization. A 10th-round draft pick by the Padres in 2015, Pacchioli played in 58 games with short-season Tri-City that year and posted a .245 average with 14 RBI and 19 stolen bases. His 19 steals led the team and ranked seventh in the Northwest League that year. Pacchioli enjoyed a noteworthy collegiate career at Lehigh University. There, he currently ranks as the program’s all-time leader in stolen bases (69), fifth in program history in batting (.344) and sixth in triples (8). He also set the single-season stolen base record (31) in his senior year and is one of just 10 Mountain Hawks to be named as a three-time All Patriot League selection (2013-15).